FLORIDA CITY – A $3 million, 11,000-square-foot facility opened last month by the United Methodist-founded Branches program is expected to triple the number of children and families receiving services here over the next two years. 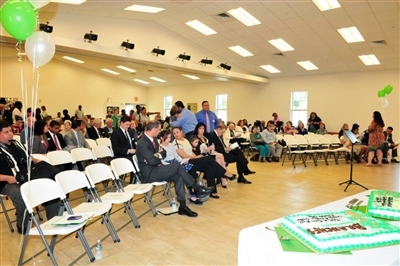 A crowd gathers in the multipurpose room of the new Branches Florida City facility to celebrate the opening. Photos from Branches. 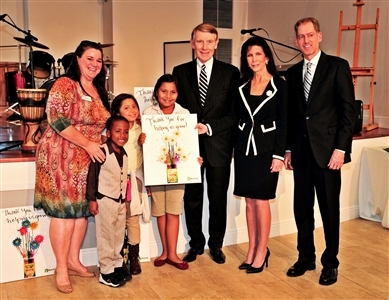 Left to right, Kim Torres of Branches and students from the Branches program present thank you cards to Dan and Trish Bell as Branches executive director Brent McLaughlin, far right, looks on. About 150 people, including leaders from the community and Florida Conference who helped make the expansion happen, turned out Jan. 22 to celebrate the opening of the Trish and Dan Bell Family Branches Center-Florida City Campus. The new building, which shares a campus with Branches UMC, includes classrooms and a recreation room, computer lab, covered patio and spacious multipurpose room. The footprint includes space for a large playground to be built in the future. According to Branches Center staff, up to 300 children and youths are expected to receive services there over the next two years, as the program continues to grow. Branches leases the Florida City space from the Florida Conference South East District for a nominal sum. The center was named for philanthropists Dan and Trish Bell, who have supported numerous charities with funding and volunteer service, including Branches and the Florida United Methodist Children’s Home. The couple contributed $1.8 million to a $5 million Branches capital campaign that included money to renovate the organization’s North Miami site, reported Isabelle Pike, Branches development director. Since 2005, the Bells have contributed almost $7 million to the Branches organization, which has grown from a single site to four branches – including two located at Florida United Methodist churches and one at a Baptist church -- serving more than 11,000 children and adults in Miami and Dade County. The Bells said in a phone interview Monday that they had been praying for a worthy effort to support after Dan retired in 2001. At the time, the couple attended Kendall UMC, Miami, and heard from Rev. Mary Susan Ward about the holistic educational approach of what was then called South Florida Urban Ministries. Dan recalls that the organization needed help with a fundraiser. Trish remembers a day about 10 years ago and what she expected to be a quick visit to the ministry’s Miami headquarters. Her husband also remembers that day. The couple said they were looking for an effort that helps the underserved not only with immediate needs but with strategies for becoming financially independent. A newly rebuilt Branches UMC in Florida City is also the site of an expanded facility for the Branches nonprofit program that helps children and families. The after-school and summer camp programs help youngsters improve their school grades as well as develop life skills and career plans. The organization also works with adults to provide training, coaching and some financial assistance to help them onto a path of economic stability. The Bells said they worked with Branches executive director Brent McLaughlin to come up with a growth plan for the organization if money were not a limiting factor. They then supported Branches’ goals anonymously with matching grants. McLaughlin, in a written statement, credited the Bells with vision as well as generosity. “The Bells first encouraged us to dream of the possibilities and then enabled us to achieve the vision through game-changing and unprecedented support of the organization through several matching grants,” McLaughlin said. Meanwhile, without their knowledge, the Bells’ son, Rod, also responded to Ward’s suggestion that he should check out the ministry. Trish and Dan Bell laughed as they recalled that the program’s organizers honored their request for anonymity and did not reveal their donations, even to their son. Rod Bell went on to serve on the Branches board and has been chairperson for about eight years. Branches named classrooms at the new Florida City facility after him; his wife, Sandy, described by Pike as an “integral volunteer”; and daughters Riley and Reese. The center’s community room was named for Kim Torres, Branches’ longtime director of student services and a General Board of Global Ministries missionary, and her husband, Raymundo. The older Bells, who now attend First UMC, Coral Gables, said they decided to give up their anonymous donor status because it was becoming difficult to maintain. Coming forward has allowed them to develop new interest in and funding sources for Branches through their business and social networks, they said. Rev. Audrey Warren, pastor at Branches UMC, said she is excited to share the new digs with children and families in the Branches program. Fire destroyed the church sanctuary in 2010, and the congregation and Branches after-school program had been operating out of portable buildings for the past few years. The pastor said she has witnessed how much the program means, particularly for children of Creole- or Spanish-speaking immigrants who often come to Branches without knowing English. In a community that has a 68 percent high school graduation rate, Branches reports that nearly all students in its program go on to graduate. Branches also offers extracurricular activities, such as drama productions with full costumes and sets, that the young participants would not be able to afford otherwise. The productions build confidence and teach teamwork skills, Warren said. She recalled how she once drew on her high school baton-twirling skills to offer lessons for Branches kids, and the group ended up marching in a local parade. Warren also credits the Branches program with fueling much of the congregation’s growth in recent years. For information about Branches programs, visit www.branchesfl.org.